We got the lift installed today and it was really fairly easy to do. It went together great and worked perfectly. Mother has already started using it and is feeling comfortable with it. This will make a big difference in her quality of life. Thanks so much! Lindsay, I just wanted to let you know how much we appreciate our new stair lift. It has been a pleasure dealing with you and your associates. I'm embarrassed to say I can't remember our installers name, but I will never forget his courteous attitude and the skill that he displayed in assembling the lift. He would be welcome in our home anytime. My wife has brain cancer and is unable to climb the steps to the upstairs where we have 2 full bathrooms. There is only a half bath on the ground floor so for her to bath properly she needed access to upstairs. She is thrilled with the new chair and says "it has changed my life dramatically". You are a first class operation and I'm glad I chose your company for this very important tool to make my wife's life much better. Lindsay, we just got our AmeriGlide Rubex AC Stair Lift installed this morning at our Church. The unit works great and will be an asset to the church. Your handling of all the process from the very first contact until our latest conversation, which was a follow up after the installation, has been a very pleasant experience. I feel sure the AmeriGlide unit will serve our needs. 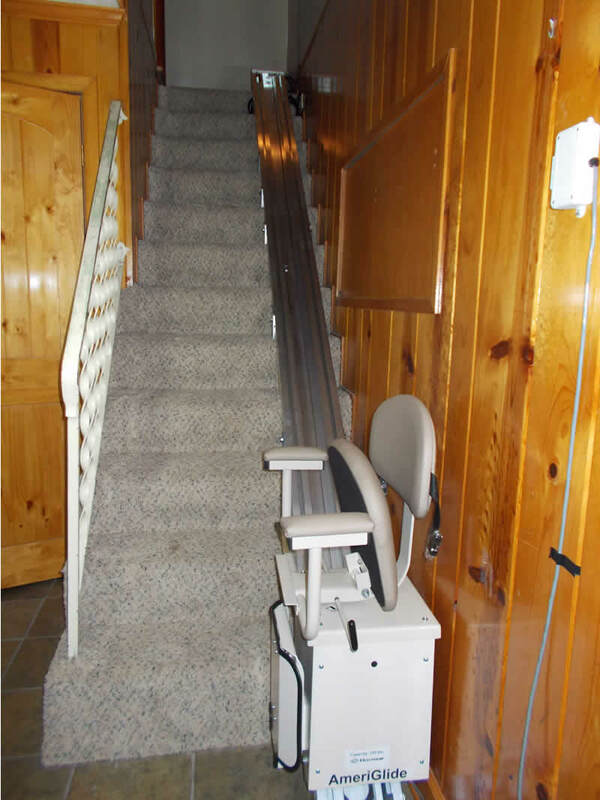 Just a note to let you know how much I am enjoying my new AmeriGlide stair lift. It glides smoothly and quietly. Thanks so much for your immediate response to my call after the fire, and for taking care of all the paper work needed for my insurance company. I am looking forward to many years of riding safely up and down the stairs. My knees have been replaced and I feel that my stair lift is extending the life of my implants. Also, this lift extends the time I can continue to live in my home. It is definitely a necessity in my case. Thanks again Lindsay, Joyce. To AmeriGlide, Something happened to my stair lift, my home was hit by lightning. The main thing is that Lindsay Sheffer worked on the problem until it was fixed. She called the factory many times. I talked to the technician at the factory. I am happy to have my lift working. Everyone was courteous and prompt. Thanks everyone. I already LOVE it! I was preparing for guests today and realized I had the serving pieces I needed downstairs, where they are stored. Zip, and I was down the stairs, then en route back up with the items. I didn't have to bother my hubby to do this for me, and that was nice. I know he would be willing, but there's a difference between my telling someone what I need and precisely where to find it (implying a well-thought-out pre-request process), and thinking about what I needs as I paw through things my own self. Last nite I took one of our cats, Doo-Dah, down and back. What a hoot! She seemed to love it! So far (and it's only been in since Saturday afternoon), 5 people who don't live here (and a cat) have all been mightily impressed - as are the homeowners. Great product!